Volutes, it’s a shape and a scent, intimately linked: the volute1 and tobacco. It’s also the scent of the labyrinth of waxed corridors and panelled lounges, the mysterious, and elegant ladies leaning on the ship’s rail smoking their Khedive cigarettes. I have an abiding fondness for the French niche line Diptyque. They made three of my early perfumista favorites, all of which are still regulars in my rotation: Philosykos, Tam Dao and L'Ombre dans L'Eau. Olène and Oyedo are old friends that I still visit when I'm in the right mood, and if I had not long since drained my decants of Virgilio and L'Eau Trois, they'd get an occasional nod too. Since Tam Dao, Diptyque has become a kind of go-to house for muted fragrances on familiar themes. They’re well done, in fact some of them are fantastically well done, but they aren’t often surprising, and with the current glut of niche fragrances — it’s hard to think of a single theme, vanilla included, that hasn’t been explored to the heavens and back again in the last year or two — a little surprise is a welcome thing. Eau Mage had a bit more heft and personality than some of the brand's recent offerings, but never made it to my buy list, and nor did 34 Boulevard Saint Germain or Eau Rose. As backstories go, it's a good one — add the "ports of call with enchanting names, Port Said, the Suez Canal, Djibouti, Colombo, Singapore" mentioned in the press release, and that should be enough glamour and romance for anybody, no? And Volutes comes reasonably close to living up to it without straying from the house's post-2005 aesthetic: if you're after a deep, rich oriental, you're bound to be disappointed. The opening is bright citrus, joined quickly by tobacco, but the smoothest tobacco you can imagine, transformed into a veil of powder by iris and no more than mildly spiced (the notes: wax, dried fruit, pink pepper, black pepper, saffron, hay, tobacco, iris, immortelle, myrrh, styrax, honey, opopanax and benzoin). As it dries down, the tobacco takes on a slight cherry flavor and is softened by light incense and resins. It gets sweeter, too, but Volutes never gets honeyed or heavy enough to overwhelm. The first time I wore it, it didn't strike me as particularly smoky; on later wearings, the smoke was somewhat more pronounced, but even then, it is not the sort of thing that will make you feel that you're wearing an ashtray. It's worth a try even if you don't normally like tobacco notes (and I'm not always the biggest fan of tobacco myself). The Eau de Parfum version emphasizes the iris note. It is a fuller, richer experience, somewhat spicier, definitely sweeter, definitely woodier. We are talking degrees, mind you, as even the Eau de Parfum is not what I would call a heavy fragrance. Still, I was surprised to find that I much preferred the Eau de Toilette, which is drier and livelier, and allows the tobacco note to shine through more clearly. Diptyque Volutes is available in 50 ($88) and 100 ($120) ml Eau de Toilette and 75 ($140) ml Eau de Parfum. For buying information, see the listing for Diptyque under Perfume Houses. More reviews of Volutes: Bois de Jasmin, Grain de Musc, The Non-Blonde. 1. 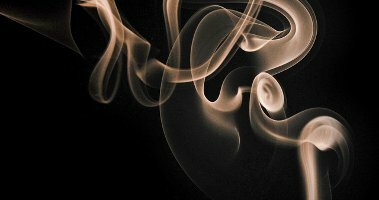 Volute de fumée is a curl of smoke. 2. Although I was mighty tempted by the new Eau de Parfum versions of Philosykos and L'Ombre dans L'Eau, and all the more so when a Diptyque counter suddenly materialized at my local Nordstrom. If they had not redesigned the bottles in the meantime, I'd have been helpless to resist; as it is, I am not fond of the new bottle shape and will wait until I've drained the bottles I have. 3. From interview with Fabrice Pellegrin, download from Diptyque's website. 4. I have added Volutes to my "buy list", but that list has evolved into more of a theoretical rating system than an actual plan to acquire more perfume — I add fragrances to the list if I like them enough to think I might like to own some quantity, but adding even 50 ml of anything to my already overly optimistic collection requires a huge commitment, and there are fragrances that have languished on the list now for years. It would be perfect if Diptyque released Volutes in their travel spray refills, and I could purchase a single 12 ml travel spray (they are sold in trios). Not likely, but you never know. Note: top image is curls and whisps [cropped] theirl at flickr; some rights reserved. I asked a SA about this about a month ago, it wasn’t out yet but she let me have a sneaky sniff from the tester bottle which she already had under the counter. I didn’t realise that it came in different concentrations so I have no idea which one I tried. I found that it opened with a powdery, slightly rooty iris and then developed into a tobacco scent right before my erm…nose. It was like smelling two completely different perfumes in the space of 5 minutes. I did find it quite honeyed and sweet and definitely on the heavy side when compared to Diptyque’s more recent releases. Not heavy per se, but definitely a departure from what they’ve been doing recently. Having only smelled it on a blotter, I’m wondering if I should try and score a sample now. I’m going to guess that you smelled the EdP — the iris is much more prominent. But who knows! The EdP has the darker of the 2 labels (in the picture above, in the center). Either way, agree, not heavy, but heavier than what they’ve done lately. I like the EdP ok, but glad I smelled the EdT first — I think it’s a more interesting scent. I’m thinking it might have been EdP too, it had enough heft for a stronger concentration. If the EdT is more interesting then I’m definitely going to seek it out and give it a proper test. Volute was fun to test. The backstory, the notes and the early reviews of the fragrance were very much to my taste. But I’m not a huge fan of Dyptique’s perfume, so I was only mildly curious. Turns out I might be the only one finding the edp and edt different enough to intensely dislike the edp and really like the edt. It’s because of the spices: the edp packs a punch. The edt is very nice, but I’d put it in the same cathegory of Herme’s Ambre Narguilé, and I prefer AN because it lacks the spicy kick. Anyway, these orientals on a diet make me want to reach my Shalimar, pronto! Diet orientals, yes! But for me, they have their place; I don’t always want to be wearing something as heavy as Shalimar, or even Ambre Narguile, in fact, I think as a rule I tend towards sheer more than heavy -> so long as the scent has personality, and isn’t just a bland crowd pleaser. Hi! Kind of new here, but I absolutely love the reviews! This sounds like an interesting scent. I’m a little embarrassed to admit that I’ve just recently discovered (and love!) Eau Lierre. I also wish they would introduce smaller (less expensive) sizes. It’s hard to shell out that sort of money even for stuff I love! Are there any websites out there that have decent sales on Diptyque occasionally? I’ve never seen Diptyque on sale but you might want to look into ordering a decant. Smaller amount = smaller price, although not per ml or oz. Surrender to Chance is a great website for decants, although I haven’t looked specifically for Diptyque. Good luck! Beautyhabit sometimes has good discounts — I’d get on their mailing list. A few of the scents are available in small roll-ons, and if you can find people to split the travel spray refills, that’s also a good deal. Oh, and will add that there are sales about once a year in NYC…sometimes w/ fabulous deals, although that’s usually when they phase out certain scents or sizes or packaging. But I’ve gotten some excellent deals that way. Google “Diptyque sample sale new york”; looks like the last one was in March of this year. Thank you so much for the ideas! Thanks for the review, Robin. I’ve been very curious about this one, and your review immediately made me wonder how different Volutes might be from Chergui. Non-Blonde’s review asserted that Volutes is not a Chergui; the sheerness of Volutes makes it a very different wearing experience. Sometimes I find Chergui a bit too heavy, so I’m thinking that Volutes might suit me. What are your thoughts on the comparison? I had exactly the same question. And also wondering how strong the honey note is in this one…? Really not that heavy at all — an accent more than a main player. Nowhere near as heavy or sweet or spicy or tobacco-y or honeyed as Chergui — it’s milder all around, less of a statement fragrance and far easier to wear. If you do like Chergui but find it too heavy, I have a feeling you’d like the EdT of Volutes better than the EdP, but anybody thinking of buying it would do well to smell both versions if possible. Thank you for the great comparative review Robin. I wasn’t planning on trying this one because I loathe the smell of tobacco, but your description of the iris and incense has changed my mind! I don’t loathe the scent of tobacco, but then again don’t think of it as a favorite note, and sometimes it is too harsh or masculine for me even though I wear many men’s fragrances. I do think it’s worth a shot, although in your case, you might then prefer the EdP since the tobacco is more muted in that one (at least, to my nose). On another note, I really love L’Eau de Tarocco (in the spray, the roll on). I never hear any reviews on it, but it is my favorite Diptyque. Interesting! Diptyque makes a pomander candle, too, but it’s more of a Christmas-y sort of scent. Your buy-list for perfume is like my wish list on iTunes: more a bookmark of interest than a definitive plan of action. There’s this scary button on my wishlist that says “Buy All” and the total number on that button would single-handedly overdraft me. It’s a scary button. The buzz on this scent makes it sound very appealing but I’m not in buy mode with perfume right now, unfortunately, and my store doesn’t get new stuff, almost as a rule. Oh thank heavens I do not have a “buy all” button. Can’t imagine, not least because when I do buy, it’s rarely the thing I want the most — it’s usually something spur of the moment, based on price & availability. I was impressed with the EdP on a blotter, but I’ve never tried it on skin. L’Ombre also comes in a (cheaper) perfume oil roll-on, but I’ve never tried it — would think it would be more concentrated, but also have less sillage. Anyway, totally agree — everything should be in 30 ml or less. I am just happy it is available in 50 ml. Small favors. And for less than $100, which these days seems another small favor! I really enjoyed the review, Robin, as I have a small decant of Volutes EDT on its way to me as I write this. I wasn’t sure about the tobacco, and I’m still not sure about smoky (it can work or not), but this certainly sounds interesting. Coincidentally, I have some Panache on the way as well. Like you, I tend to be a fan of Diptyque. I especially love my L’Eau de L’Eau, Philosykos, and L’Eau de Tarocco. Oh, hope you will like it. And lucky you on the Panache. I should really get some; wish PdR did smaller sizes. Or was cheaper! L’Eau de L’Eau is a terrific scent, I think since it is essentially a more muted version of something they’d already done, it did not really change my overall viewpoint on Diptyque, if that makes sense? My Nordstrom not only got the line, they gave them a whole counter…it’s really a fair piece of real estate given how crushed the whole beauty dept is. I have a feeling they’re testing it out, though — I won’t be surprised if it disappears, or is suddenly just a little shelf somewhere. I’m excited to try this! Lighter tobacco seems like it might be just the thing for fall. Side note… how would you compare the Philosykos edt to the edp? I’ve drained a decant of the edt and had planned on purchasing soon, but I think it may be a good idea to test the edp before doing so. Thanks in advance! Hope someone else will chime in…I just tried them on paper so far. My initial reaction was that they were well done, but that in the end I might like Philosykos better in EdP and L’Ombre better in the EdT. I will try them on skin before I decide, though! I also love the earlier Diptyques – L’Ombre dans L’Eau, Olene, Virgilio and L’Eau are the ones I own. And I like tobacco notes in perfume – Ys Uzac Pohadka and Via Del Profumo Tabac are favorites – so I’m really looking forward to trying Volutes. It’s good to know that I really should try both concentrations before deciding. I tend to think perfumers are turning to tobacco as a deep natural to replace some of the classic notes lost to IFRA (just a hypothesis). I just did a search for “tobacco” on LuckyScent and was surprised to find how many perfumes include it. Now I’m dying to try Phaedon Noir Marine, which references Egyptian cigarettes and mint tea, and promises “a virtual trip to the Old Cataract Hotel in Assouan in the days of Agatha Christie”! Oh, you might be right about tobacco, I didn’t think of it that way! I think we had opposite reactions! I thought the EDT was much sweeter and heavier on the immortelle. The EDP was better on my skin. I liked it a lot. I am in the process of writing reviews of the new EDPs and I have to say I prefer the Philosykos in the EDP form, making me glad I never got around to buying a bottle of the EDT. Glad to hear another view, thanks! Thank you so much, Robin, for a wonderful review! I fell for a Diptique line after a wonderful experience at their San Fran store. My current favorites are L’Ombre dans L’Eau in EDT and Olene in EDP (need to test and compare them more directly to be sure). I got a sample of Volutes from the store yesterday, definitely EDP. I am pretty sure I would like EDT better based on your description. I wish I was more attentive and gotten both! See Tama’s comment, though, sounds like she had the opposite reaction. Do see if you can try both, though. Robin, do you think there is much similarity to Tabac Aurea? I am thinking the EDP, which I prefer, might be pretty similar. TA would be a lot cheaper. Oh dear, have not smelled TA in a long time. Going on memory, that was much deeper, heavier on the tobacco, heavier on the amber. Kevin swears that Volutes is an awful lot like Viktor & Rolf Spicebomb, but I can’t verify that either.